Home » Animals » Blankies, Bananas & Bears, Oh My! Have you ever noticed how little kids will latch on to a favorite hat, or shirt, or pair of socks that they just HAVE to wear every day and act as if it’s the end of the world if you suggest they skip a day so you can put the beloved piece in the washer? I’ve never done a study on this but I’m guessing that this phenomenon it’s probably one of the stepping stones to becoming independent (weaned from their mother’s breast, consoling themselves with their own thumb, parenting their teddy-bear in the ways that they learned, and now, gingerly taking those first steps out in the world as a “big kid”, where lugging your stuffed animal or blankie everywhere you go is no longer socially acceptable.) Looking back to when my son began that phase brings such a smile to my face as he was just so enthusiastic about everything . Rob’s particular obsession was in wearing this jacket I had made for him out of an old pair of blue jeans that had a secret pocket on the inside to hide the treasure maps he had made. At recess, he’d pull them out with a flourish and lead the other kids around the playground “capturing after bear”. What a grand time he had and I admit not feeling the list bit guilty for conspiring with him to figure out a way he could get past the unreasonably strict principal who forbid the kids from taking anything outdoors to play with. I wasn’t nearly as creative as my son when I was that age, but I did have a fixation for a while on always wearing a little white sailor hat (after I saw a picture of my Dad in the navy) and created tattoos for myself (an idea I got from Popeye, not my father!) by plastering my arms with those little blue oval stickers that came on fresh bananas in the early 1960’s from the Chiquita Banana division of United Fruit. If you’re as ancient as I am, you probably remember and can still sing the happy-go-lucky jingle sung by a Carmen Miranda-inspired character pitched by that eras “Mad Men”. It was all fun and innocence in those days, before the Banana War in South America and before we realized such abuse existed in our own country on the farms in California. As painful as it was to face the truth and to make strides towards ending (or at least no longer condoning) such practices, I can’t say that I long for the “good old days” of socio-political naivety. I do still enjoy though every once in a while, humming that happy little ditty to myself and wondering whether or not my son ever caught that elusive bear. 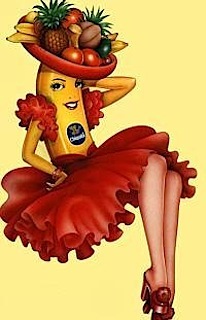 This entry was posted in Animals, Comic, Famous People, Folders, Food, Fun, Glossy, Monkey, Plastic, System Icons, Toolbar, Toys, UPDATED, User Folders and tagged 1960's Advertising, Bananas, Carmen Miranda, children, Chiquita, Free Clip Art, Monkey, pre-school, Scrapbooking, Social Psychology. Bookmark the permalink.